A really smashing stall for the village fete! 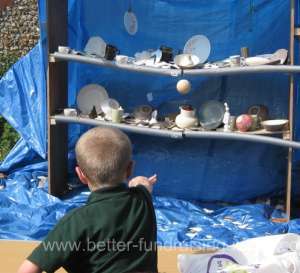 If you need a really easy fund raising idea for your Village Fete, Summer Fair or other fund raising events don't forget to include a Crockery Smash. People (especially youngsters) will always fall over themselves to smash a few plates and crack an old teapot or two! 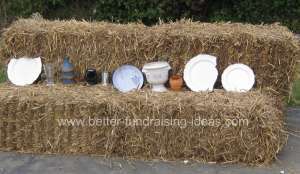 This fete idea can cause a few raised eyebrows but is simple to do, always popular and can be a nice little money maker. This easy fund raising idea is not too difficult to organise. Collecting the crockery - You need to start asking for and collecting crockery a couple of months before your fund raiser. 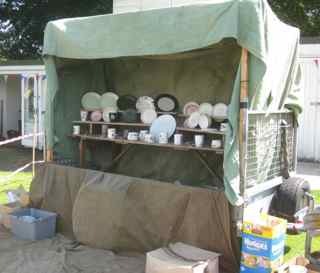 Some organisations have a year round collection tucking away old crockery for the Summer Fair. Anything that will smash will do old plates, cups, saucers, mugs, vases, ornaments etc. Ask around amongst your supporters most people have a few old, cracked or chipped items they can let you have. You can also ask at Charity / Thrift stores who often receive unsaleable crockery items. Another good source is to ask at bars, restaurants, clubs and canteens. The Smashing Arena - You need to set up your stall in such a way to display the items for smashing but also contain the wooden balls. The example above uses a closed backdrop. Another option is to set up a stall similar to a coconut shy with some kind of shelving unit where the coconuts would normally stand. The shelving structure needs to be quite secure as it will take a fair pounding. Another easy way to set up your crockery for smashing is to have one simple plank set up with another bit of wood at its back to lean the pieces against. Another option is to suspend your crockery from a scaffold pole. A simple bit of twisted wire can be fashioned into simple plate holders that can then be hung by strings or hooked directly onto the pole. In the rig up at the top of the page the stall is set up on top of a trailer, so all the smashed crockery is ready to go straight to the tip at the end of the day. Whatever set up you use do ensure that you have something underneath to make picking up the smashed crockery at the end safe and easy. A tarpaulin or an old bit of carpet are ideal. On that note ensure that you have a sensible way of taking the smashed crockery away at the end, plastic dustbins, crates, boxes or builders heavy duty rubble sacks will be needed and transport to the tip. Safety - You need to ensure that people will not get hit by rebounds or flying crockery. Also have stout gloves on hand for retrieving the balls from amongst the crock. Add a bit of spice! - Make sure that you maximize the impact of your stall to encourage people to have a go. Pay Us Your Cash To Have A Good Smash! Similarly writing on the crockery can really get people going. Rival football teams, politicians, tv personalities, pop stars all make smashing the plates more satisfying! 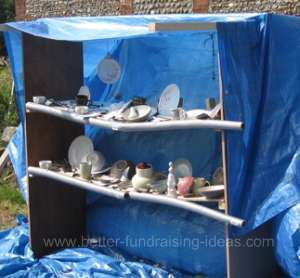 A Crockery Smash is an easy fund raising idea.